Body Matters in Gorleston-on-Sea near Great Yarmouth is a salon specialising in health, beauty and anti-ageing treatments for both men and women. Pampering, relaxation, cosmetic or regular maintenance treatments, Body Matters do it all. From Great Yarmouth follow signs for Gorleston-on-Sea. 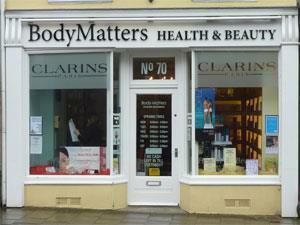 Body Matters is located mid-way along the main High Street.